In 1897, doctors, reporters, and diplomats attending a conference at the Sorbonne marveled over a novel contraption presented to them: a coffin designed to alleviate anxieties over premature burial. Taphephobia (fear of being buried alive) was particularly widespread in Victorian-era Europe and the United States, growing as newspapers published horrific accounts of unnecessary interments. People were terrified that doctors were unable to differentiate between death and profound lethargy, comas, or trances, which could strip patients of perceivable signs of life. 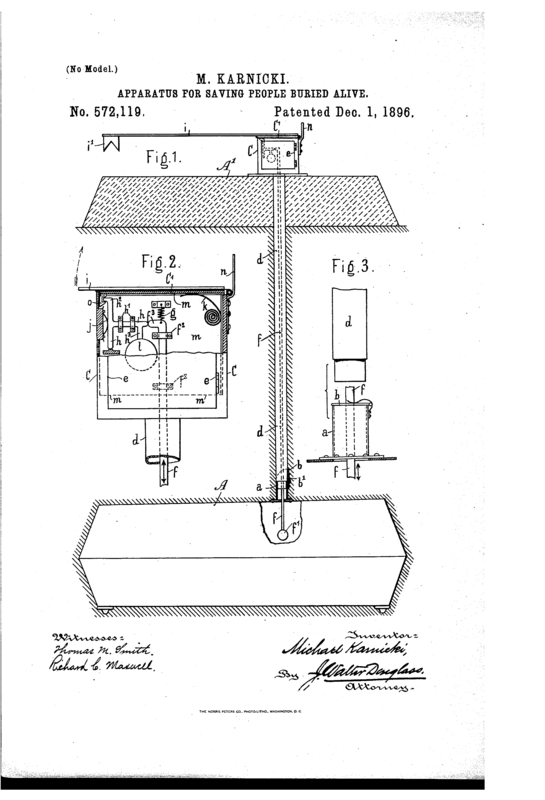 The new safety coffin, patented the previous year by Count Michel de Karnice-Karnicki, a chamberlain to Russia’s Nicholas II, arrived as the seemingly perfect means to compensate for such potentially lethal misdiagnoses. Known as Le Karnice, the mechanical apparatus equipped any poor soul lying slowly suffocating in a box underground with tools to survive and signal for help—even if still in a trance. On ground level atop the grave sat a spring-loaded iron container, connected to the coffin’s interior by an iron tube. From the tube’s lower end, a glass ball dangled over the interred’s chest, so any slight bodily movement that disturbed it would release the spring. Like a jack-in-the box, the container would then pop open, welcoming air and light into the coffin. To attract anyone in the cemetery, the box even housed a bell that would chime loudly, and a flag attached to its lid that would shoot up 4 feet tall. Some reports add that the box also had an electric lamp that would burn to provide light after sunset. And if none of those tricks sufficed, anyone buried alive (assuming they were fully awake) could shout for help through the tube. The count, according to his publicist Horace Valbel, had become so obsessed with preventing premature burial that he had received the tsar’s permission to take leave from his duties as chamberlain to find a solution. (The duties associated with Russian court titles can be unclear, but sources seem to indicate that a chamberlain was a position akin to a chief of staff. They were often counts.) Karnice-Karnicki had apparently witnessed a young Belgian girl nearly buried alive, who had been awakened just in time by the thud of earth shoveled onto her coffin. Unable to forget her screams, he shut himself up for four years in a castle, tinkering away. What made the design particularly appealing was its marketability: easily transportable, the apparatus on the top was designed for reuse, so its cost would remain low and it would be accessible to people of all financial means—it was, ultimately, supposed to be a humanitarian invention. Since it involved no complicated machinery, the average cemetery worker would also be able to construct it. The coffin also eliminated the drawbacks of waiting mortuaries, where people lay in communal rooms until they were determined to be truly deceased. Since it was also hermetic, Le Karnice prevented putrid gases from rising to the living world in the event of actual decomposition. The count traveled through Europe to showcase Le Karnice, as Jan Bondeson describes in Buried Alive: The Terrifying History of Our Most Primal Fear. One demonstration, however, went awry, with an assistant unable to trigger the flag and the bell. He eventually escaped after some anxious digging by Karnice-Karnicki, but the press was unforgiving, and Le Karnice’s reputation was forever tainted. Medical experts, too, started expressing reservations. At a meeting at the Académie de Médecine in Paris, the hygienist M.E. Vallin argued that the coffin was too sensitive: abdominal swelling during putrefaction—often a definitive indicator of death—could set it off. His detailed case for its impracticality led the Académie to forgo its proposal that municipalities each buy one for lease to a potential corpse at one franc a day. "According to the declarations made by grave-diggers of the great cities of all countries, when, at the end of five years, the dead are removed from the common grave, they find in the coffins convulsed skeletons, with fists clenched, twisted and raised to the jaws! In every part of the world, there is not a community of any importance, town or village, where some memory is not preserved of people buried alive, and this memory remains like a permanent terror through all time!" Back in New York, Camis displayed the coffin for a number of years in a showroom at 835 Broadway near Union Square, and he made known his eagerness to test-trial it to convince any skeptics. A resolute salesman literally loyal until death to his product, he was even willing to volunteer to undergo repeated burial to prove its purpose. For all Camis’s efforts, though, Le Karnice never did take off in America, nor in Europe. Besides unquelled fears that it might fail to function, its reported hypersensitivity introduced strong concern over false alarms—and unnecessary exhumations of decomposing corpses were nearly as undesirable a vision as being buried alive.